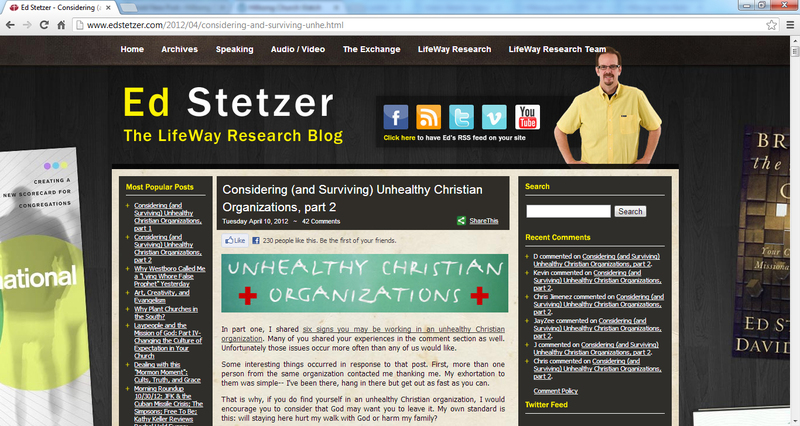 In part one, I shared six signs you may be working in an unhealthy Christian organization. Many of you shared your experiences in the comment section as well. Unfortunately those issues occur more often than any of us would like. Some interesting things occurred in response to that post. First, more than one person from the same organization contacted me thanking me. My exhortation to them was simple– I’ve been there, hang in there but get out as fast as you can. That is why, if you do find yourself in an unhealthy Christian organization, I would encourage you to consider that God may want you to leave it. My own standard is this: will staying here hurt my walk with God or harm my family? You might be able to handle it, but you have to ask how it will impact your family as well. You may notice that the leader often talks about the priority of family, but generally only gives priority to his or her own family– if even them. You are the only one who is advocating for your family– protect them. Being at a place that “makes a difference” sounds good, but if you end up with a confused spiritual life or broken family, it is just not worth the price. You do not want to be a “great place” and have a broken life because you have become warped by the culture around you. Second, the leaders that stay take on the unhealthy characteristics of the organization, becoming part of the problem (even though they often bemoan the attributes of the leader). In a sense, we reproduce who we are– creating “mini-me” personalities of the leader. Yet, that is what the unhealthy leader wants– no one to disagree or give another idea. So, in all likelihood, your best scenario is to leave. If you believe you need to leave, start praying and looking for another ministry opportunity. This recognition of a different future will likely ease the daily pain and struggle, and help you to face each day. When you know you are going to leave, you can deal with staying a lot easier– and I know this from personal experience. When I have been in unhealthy situations, once I decided I was going to leave I did not worry so much about what was going on around me. Either way, trust your future to Christ and he gives peace that passes all understanding. 1. Don’t be afraid. Fear makes you cower rather than live in courage. Recognize you are in an unhealthy organization, but don’t become an unhealthy servant. I assure you, this will make you stand out (and people will say bad things), but don’t be a coward for any reason. 2. Make a difference. When I served in unhealthy places, I simply asked, “What can I do here, now?” And when you are not scurrying about in fear, you can get much done for the kingdom. I was able to encourage a lot of people– often those living in the same toxic culture. 3. Speak truth. Don’t be afraid to tell the truth about the culture, and when appropriate, the leadership. There will probably be some pushback, or even retaliation, but as you tell the truth with grace and humility, you may be heard–or it may reveal that you need to go. 4. Recognize the Lord may have other reasons for keeping you in your position. Perhaps you have another ministry in your city or church. If that is the case, contribute where you can in your job, recognize how it provides for your family, but focus your energies on your ministry. I know some who continue to work in unhealthy organizations, but stay out of devotion to their local church ministry or other calling. They endure the unhealthy organization to pursue their calling with joy. These are not easy answers. It may be some are struggling in their places of service and don’t know where to turn. I encourage you to pray and seek the Lord’s wisdom in your calling. It may be that you will be called to do some difficult yet courageous things. Have you left a ministry? Have you stayed? What was the result? Did you make the wise choice? What did you learn? Share your thoughts with us below. As I am doing for this particular series, the comment rules about anonymous posting are suspended but please be wise in the words/names used in your comments. NOTE: SCREEN GRAB WAS TAKEN ON 18/11/2012.